The breadth of the building called for a dual focus. For the perimeter offices, Puget Sound and Seattle’s waterfront are the primary attraction; for the interior spaces, Hewitt Isley created two atrium areas filled with daylight and the rippling music of a 400 foot stream. 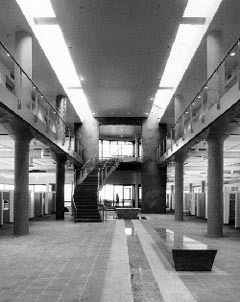 Both the perimeter offices and the atria share their abundant daylight with the open office space between. Hewitt Isley’s design approach of respecting the original structure while contrasting it with the new influenced the design of the two atrium spaces. The pier’s original structure was three stories high at the east end but only two stories at the west. The design team wanted to create two atrium spaces along the length of the building. But the existing sawtooth roof at the east end was higher than allowed by current building codes; so it couldn’t be replicated on the west. In addition, the sawtooth form couldn’t easily accommodate a penthouse for the new mechanical equipment. Thus Hewitt Isley chose to change the roof form at the west end atrium, creating two delightfully different interior environments. The new west atrium has both north and south facing glazing at the atrium edges with the needed mechanical penthouse sandwiched in between. The bold shafts of sunlight here (which would be problematic in a more formal work space) are a warm contrast to the more subdued, even daylighting from the north facing clerestory windows of the east atrium. A 400′ granite embanked stream runs the length of the building uniting the two atria and recreating that northwest experience of wandering along a stream moving from quiet, forested light to dancing sunlight. Photocell controls regulate indirect metal halide lights in the atrium, turning them off when sufficient daylight is present. This saves energy and money and lengthens the life of these hard to reach lamps. The perimeter offices have a rich “layered” approach to sunlight control. Large aluminum shading devices on the south elevation block direct sun penetration during the summer while letting in lower angle winter sun. The north elevation on the other hand, has a sleek, flat facade to maximize penetration of diffuse northern light throughout the year. The next layer of control is the window glazing itself. The architects selected Azurelite glass from PPG, one of a new family of high performance glazings. Azurelite’s special blue-green tint reinforces the Port’s aquatic setting and selectively admits the visible portion of the solar spectrum (high visible transmission) while blocking the infrared, heat containing portion (low shading coefficient). The double glazed window units also incorporate a low-e film to reduce winter heat loss. Interior perforated metal mini-blinds are the final defense against direct sun penetration. These redirect sunlight onto the ceiling of the space in their open position, while preserving a view out through their perforated surface, even in their fully closed position. All perimeter offices and conference rooms have fully glazed interior walls to share daylight and the magnificent waterfront views with interior corridors and adjacent open plan work spaces. In perimeter offices, electric lighting works with daylight to balance light levels and save energy. Each 12’x12′ perimeter office has two 2’x4′ recessed troffers with parabolic louvers. These 3-lamp luminaires are equipped with energy efficient T-8 fluorescent lamps and electronic ballasts. Inner and outer lamps are separately switched, allowing dual level control for varying daylight levels and occupant needs. The outer two lamps are activated by a switch-mounted occupancy/daylight sensor. When someone enters the space, the occupancy sensor turns on the outer two lamps only if the daylight level is below a predetermined minimum level. If higher light levels are required, the occupant can manually activate a separate wall switch to turn on the inner lamps. This three step approach ensures that lights are off when the space is unoccupied and only the minimum number of lights are on when it is occupied. Energy savings from a system like this can top 30-50%! Pier 69’s renovation stands as a strong example of coupling dramatic design with lighting energy savings. In work areas, daylight is tightly controlled and integrated with the electric lighting scheme to maximize lighting quality and energy savings. In the more social atrium areas daylight breaks free of its tight controls and splashes out in dazzling sunlit displays – so welcome in our gray Northwest. Lighting Designers: S. Leonard Auerbach & Assoc. Controls: Esmond Petska & Assoc. The CLTC study included 8 offices, which is not a suitable size sample to publish any data. In my small company, people prefer different desktop lighting levels, varying from 40 to 120 fc. There will be significant differences in the 8 people (8 offices), and this was not taken into account.